Firebug is a very popular extension for the Firefox web browser that provides web developers with an immense set of development related tools that they can make use of on the website they are on right now. 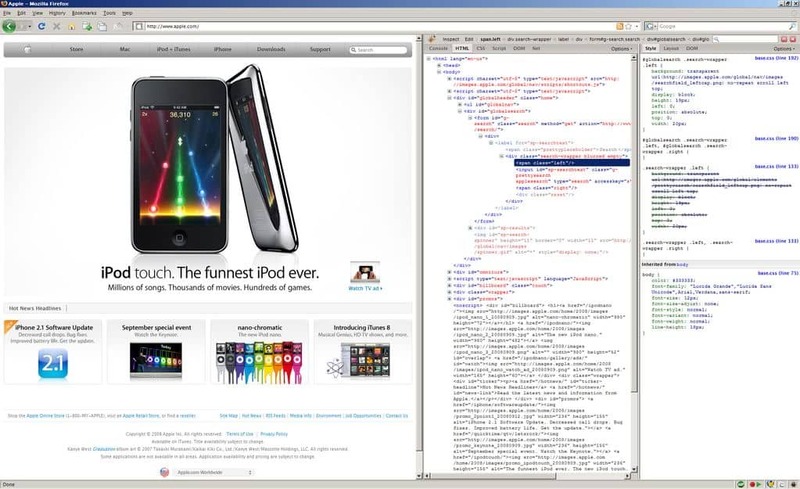 The Firebug extension divides the screen in an upper and lower part with the lower part displaying the web development information and tools that users can interact with. Update: Widerbug is no longer available, its developer retired the add-on in 2011. The rise of Developer Tools in modern browsers with support for various display layouts is probably the main reason for the decision. Widerbug is a tweaked version of Firebug that has been specifically designed for widescreen monitors. Instead of dividing the computer screen horizontally, it divides it vertically by displaying the Firebug information in a sidebar on the right side of the web browser. This is good news for web developers who use widescreen monitors as it not only makes better use of the space but also frees up space at the bottom of the browser window which would have been used by Firebug to display the tool's interface there. A previous installation of Firebug has to be uninstalled from the web browser before Widerbug can be installed to avoid complications. The web development application can then be installed and uses the same shortcuts as Firebug with the only difference that the tool is opening on the right pane and not below the actual website. The only possible problem that users could run into are update delays as the developer of Widerbug needs to update the extension whenever Firebug gets updated to make sure the latest version of the add-on is supported. Update: Widerbug has been discontinued as widescreen support has been added to Firebug. To make use of it click on the red window icon in the Firebug interface. It will detach the Firebug window from Firefox so that you can move it to the side of the browser window easily. You can download the most recent version of Firebug from Mozilla Add-ons. Note that you need to install beta versions of Firebug if you run Dev versions of the web browser. Hm, having to uninstall Firebug is a drag. Does YSlow work with Widerbug? Widerbug is basically Firebug in the sidebar. Have not tried running both apps at the same time but would not that be overkill anyway? YSlow is Firebug plugin (yeah, plugin for plugin :) ). So thought that I need to uninstall YSlow, uninstall Firebug, install Widerbug, install YSlow… then possibly find out that it doesn’t work and do everything backwards. Lazy. Will have to try on portable installation probably, proper widescreen setup is luring. Meh. Just pop Firebug out into its own window. Part of the beauty of having multiple monitors. OK, that’s it. I just updated to FF4 and widerbug is not yet comparable with 4. One of the uses I have for widerbug is to adjust the width of the page for developing websites for tablets. Perfect for that!! I’ve been thinking of shutting down to redesign my office, I’m going to do that before going back to the silly idea of losing vertical height to firebug (I can’t believe they even put it there in the first place). Please hurry guys, if I have too much time on the redesign I’ll probably end up tearing out walls and I don’t need that. Completely agree with @Keith, we need widerbug for Firefox 4, because it has been very useful in a previous version and helped us to debug our builds. Please hurry guys and release widerbug for FF4 too. Anyway, thank you very much for previous releases and for a coming one! Another vote for Firefox 4 support. Another vote for Firefox 5 support.